Friday November 2nd 1894 It rained hard all last night and most of this forenoon. Will was laid up with a lame hand. I fixed pillow cases in the forenoon. Will helped me wash after dinner. I only put out part of the clothes. he then churned for me while I baked cokkies. I worked all the evening peeling apples that will not keep to put them up. Saturday November 3rd 1894 I worked with the apples all the forenoon after putting the clothes on the line. Will went to town after dinner to take in butter for Mrs Chalfont and Mrs Shrader. I ironed and did other work to mended the clothes in the evening and put them away. Sunday November 4th 1894 I was busy about the house all morning. I got an early dinner and we went over home awhile. Fanny got home from a three week visit to her Mother on Friday. We came home in time to do chores. I read in the evening. 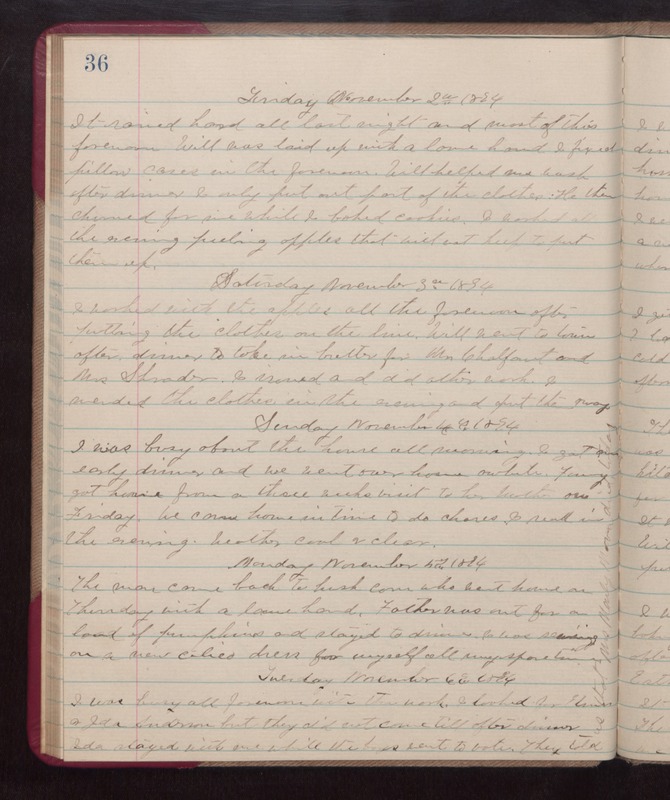 weather cool & clear Monday November 5th 1894 The man came back to husk corn went home on Thursday with a lame hand. Father was out for a load of pumpkins and stayed to dinner. I was sewing on a new calico dress for myself all my spare time. Tuesday November 6th 1894. I was busy all forenoon with the work. I looked for Eleanor & Ida Anderson but they did not come till after dinner. Ida stayed with me while the boys went to vote. They told [the following is written vertically in the right margin of the above entry] us that Mrs Manly Mason died today.